Curiosity rover made use of its Mastcam: Left camera on April 21, 2015, Sol 962, to take this wheel image. NASA's Mars rover Curiosity faces ongoing wheel wear and tear as it continues its trek across the rock-strewn Red Planet. The car-size Curiosity rover has been on duty since landing on Mars in August 2012. Curiosity has six aluminum wheels, each with its own individual motor. The rover has a top speed on flat, hard ground of a little over 1.5 inches (4 centimeters) per second. "The bottom line is that we are monitoring the wheels all the time," said Jim Erickson, Curiosity project manager at NASA's Jet Propulsion Laboratory (JPL) in Pasadena, California. One of the black, cleated aluminum wheels of the Mars Science Laboratory rover. Curiosity continues to suffer damage to the thin skin of the wheels between the treads — called grousers — that provide wheel traction. Each of Curiosity's wheels is about 20 inches (50 centimeters) in diameter and 16 inches (40 cm) wide. The wheels have "grousers," forming something akin to a tread pattern. The skin of a rover wheel is just 0.03 inches (0.75 millimeters) thick, with the protruding grousers providing structural strength. Erickson said that, to date, no grouser has been broken — and that's a good thing. "You can break one. It looks bad, but not horrible. We aren't there yet," he told Space.com. Special wheel tests have been performed at JPL. Even with two-thirds of the inner part of the wheel gone, driving on that outer one-third of the wheel appears doable, Erickson said. 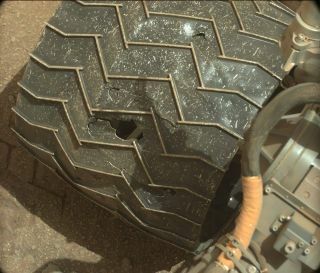 Curiosity's two front wheels began accumulating damage early in the mission. That wear and tear continues, and now the rover's two middle wheels are showing major damage, Erickson said. But "the rear wheels are still almost pristine," he said. To help cope with the wheel situation, Curiosity engineers are looking at software changes on the vehicle, "to try and make things a little bit better," Erickson said. "They've had some good tests, but it's not ready for prime time yet." The software could provide situational awareness to the wheels, Erickson said, matching wheel drive with electrical current, depending on what terrain the rover faces. There remain uncertainties about how much overall wheel life is left on Curiosity, Erickson said. One helpful remedy is to carefully guide the robot through less-damaging terrain, he said. Team members spend significant amounts of time planning out Curiosity's routes, particularly making use of NASA's Mars Reconnaissance Orbiter and its high-resolution imaging science experiment (HiRISE) camera system. Finding the right balance between wheel protection and data collection is also on the mind of Curiosity project scientist Ashwin Vasavada, also of JPL. This new image of Curiosity's ongoing battle with wheel damage was taken June 30, 2015. "Curiosity's engineering and science teams have spent over a year understanding how the rover's design and driving algorithms — and Mars' terrain — led to more wheel damage than was expected," Vasavada told Space.com. "We've also developed a wheel test bed to better predict how the wheels will degrade over time, under certain conditions." In addition, Vasavada said that Curiosity teams have mapped out a network of routes up Mount Sharp — the 3.4-mile-high (5.5 kilometers) mountain whose foothills the rover is exploring — that vary in their scientific value and also in risk to the robot's wheels. "This allows the project as a whole to find the right balance between our scientific progress and factors like wheel wear, slopes, navigability, etc.," Vasavada said. "It all looks quite optimistic and manageable at this point." From all of the simulation testing, "the wheel assessment is that we haven't used up 50 percent of the wheels as yet ... and we've been driving for three years. I guess I'm neither optimistic nor pessimistic," Erickson said. "I am more resigned to the fact that we have a consumable."